Same Sky Founder Francine LeFrak addresses the audience at the UN Women for Peace Association Awards Luncheon. 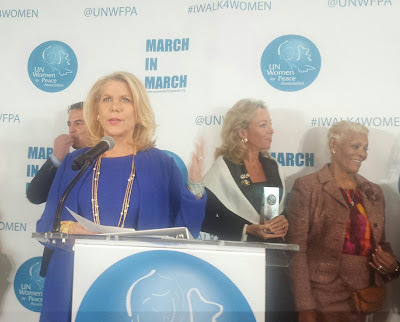 Standing behind her are award recipients Eugenio Lopez Alonso and Princess Camilla of Bourbon Two Sicilies, as well as UNWFPA march and rally grand marshal Dionne Warwick. Photo by V.W. Francine LeFrak was a most eloquent speaker this afternoon at the United Nations as she accepted an award on behalf of Same Sky, the jewelry collective she founded in 2008 to provide training and employment to female survivors of the Rwandan Genocide who are living with HIV/AIDs. 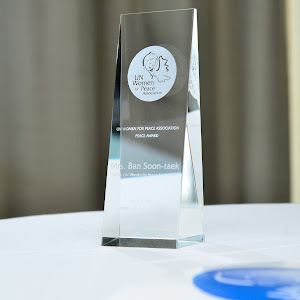 Individual honors went to United Nations Secretary-General Ban Ki-Moon, Princess Camilla of Bourbon Two Sicilies, Eugenio Lopez Alonso, president of Fundacion Jumex Arte Contemporaneo and Mrs. UN Secretary-General, Ban Soon-Taek, patron of UNWFPA. Working in tandem with various UN agencies, UNWFPA has as its mission to raise awareness and funds to prevent violence against girls and women. 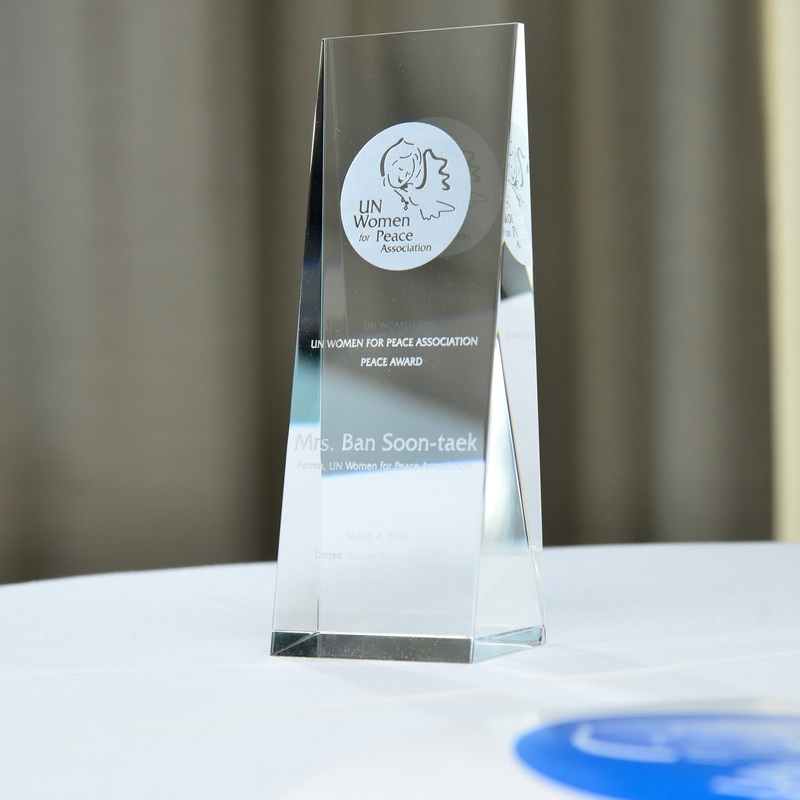 The UN Women for Peace Association award. Photo courtesy of Patrick McMullan Company. Women and girls, the very population served by Same Sky. Impassioned, FLF challenged the gathering, including Dionne Warwick, grand marshal of the UNWFPA march and rally on Saturday (5 March), to not turn a blind eye to extreme poverty and violence against women and girls the around the world. Pleased to share the good news of the cycle of HIV/AIDs beginning to be broken at Same Sky, FLF also encouraged luncheon attendees to purchase its Peace Bracelet. It’s a pretty thing, an arrangement of aqua pressed beads strung on stretch cord and framed by interlocking silver-plated beads. To sweeten the pot, FLF said she would personally match 100 percent of the proceeds from the sale of the bracelet and donate it to UNWFPA. 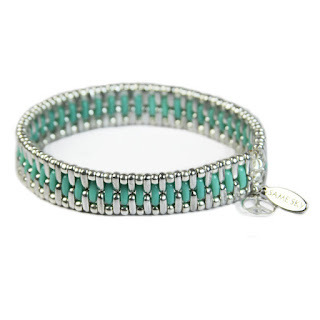 The Peace bracelet is part of Same Sky’s new End Collection of three bracelets. The collection was created to raise awareness and funds for various causes. For the month of March, proceeds from each sale of the Peace and the End Violence Against Women bracelets will benefit UNWFPA. “By wearing the [Peace] bracelet you become a part of a community that embraces women and elevates your impact as a global citizen,” FLF informed the audience. Following the philanthrocapitalist, DW rallied the faithful like any dutiful grand marshal, admonishing them to come out on Saturday wearing their marching shoes. The UNWFPA Fourth Annual #IWALK4WOMEN march and rally starts at 11:30 a.m. from Dag Hammarskjold Plaza (2nd avenue and 47th street). Proceeds from the sale of the Same Sky Peace Bracelet will benefit UNWFPA. Photo from Same Sky Website. Visit to http://www.unwomenforpeace.org to learn more about UN Women for Peace Association. Visit http://www.unwomenforpeace.org/march-in-march to learn more about the UNWFPA #IWALK4WOMEN march and rally. Visit http://www.samesky.com/ to learn more about Same Sky. Visit http://www.samesky.com/collections/the-end-bracelet-collection to learn more about the Same Sky Peace and the End Violence Against Women bracelets.